Employee, Independent Conractor, Business Owner. 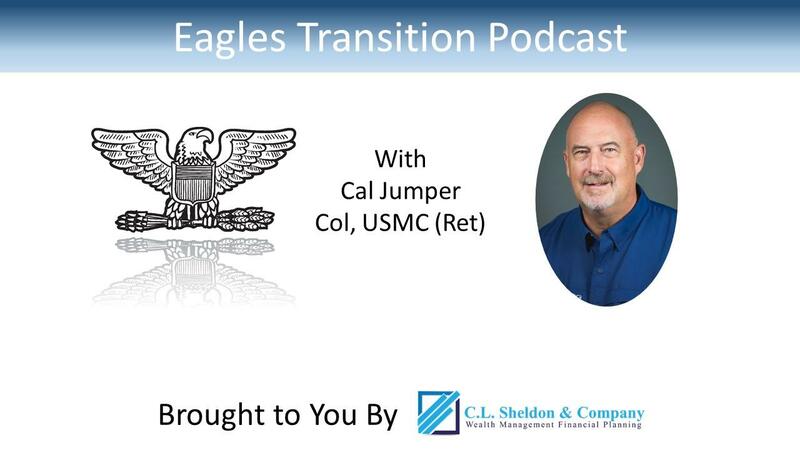 Hear How He "Did It All"
Speaker 1: Welcome to the Eagles Transition Podcast where your host, financial planner speaker and author Curt Sheldon, talks to senior military officers who have made the retirement transition before you. You'll hear about different hiring processes, interview questions, salary negotiations and how each one of them successfully settled into a rewarding second career. Now, here is your host, Curt Sheldon. Curt Sheldon: Welcome to episode eight of The Eagles Transition podcast. Today I'll be talking with Cal Jumper. Cal is a retired Marine Corps Colonel and fighter pilot. Like most fighter pilots, he has a call sign, Wookie. Wookie has an interesting story as he has landed a job with a defense contractor, worked as an independent contractor for a civilian company and started his own business. Make sure you listen to the end, where Wookie shares his thoughts on networking and how you should think about it, too. Curt Sheldon: But before I talk with Cal, I'd like to make a special offer for our podcast listeners. If you go to www.clsheldon.com/eagles, that's www.clsheldon.com/eagles, you can get a financial checklist to help with your transition from active duty to the civilian world which is designed for you and you can get it for free. Curt Sheldon: Now, on to the show. Wookie, welcome to the show. Cal Jumper: Hey, Curt, Jar, how you doing man? Curt Sheldon: Good, good. We're happy to have you on the show today. You are the first Marine that has been on The Eagles Transition podcast and you're the second non-Air Force member, obviously a little bit tilted toward the Air Force because that's where I tend to know people, but really happy to make the show just a little bit more purple today. Curt Sheldon: So to get things started, maybe, why don't you tell the audience what you're up to now. Cal Jumper: Well, I'm pretty much retired. I decided to go back to school. I'm working on a second masters, this one in public history with a focus on military history. And I'm going to the University of New Orleans. Curt Sheldon: Okay, I know for a fact that you didn't just retire from the military and retire retire. You've done a few things along the way, so why don't you start with what you did right after you retired. Cal Jumper: Okay, sure, Jar. I initially started working in traditional defense contracting role for Booz Allen Hamilton. That was immediately after I retired and I stayed in New Orleans supporting the Command that I retired from and I worked for them for about six years. Curt Sheldon: Okay, now, leading ... Let's maybe talk a little bit about leading up to that. What did you do in the Marine Corps? Cal Jumper: Oh okay, I was a pilot. I flew F-4s and F-18s and quite a few other planes. I retired as a colonel. I was the Chief of Staff of 4th Marine Aircraft Wing, our Reserve Aircraft Wing, headquarters is in New Orleans. Of course, we have units all over the country. Curt Sheldon: Maybe talk to me just a little bit about being a Chief of Staff, which is a pretty busy job and trying to work the transition process at the same time. Cal Jumper: Well, that's a good point. It's a busy job and I did not do the things I needed to do to be prepped to retire and transition. I focused 100% on 4th Marine Aircraft Wing and the Marines and Sailors and civilians in that organization and I really didn't do a great job of taking care of myself. I was very fortunate that a few months before I was about to retire, the Naval Aviation started incorporating the Naval Aviation Enterprise and Booz Allen Hamilton was the facilitator, so to speak, of that program. I had quite a few connections that were working with Booz Allen Hamilton that were looking for a Marine or somebody that talked Marine aviation to help, at least the reserve side of Marine aviation, make that transition to the Naval Aviation Enterprise. So it fell in my lap. I was fortunate that it did and very much enjoyed my time doing that. Curt Sheldon: So how did the Booz folks find you? How did they know about you to start talking to you about the position? Cal Jumper: It was all about networking. I had several colleagues and friends that were part of the Naval Aviation Enterprise, working for Booz Allen Hamilton and they knew that I was getting ready to retire and they knew they needed to fill a billet in New Orleans supporting 4th Marine Aircraft Wing so it just fell in place. But it was all about networking. Curt Sheldon: Okay, so due to your network, you were able to find the position and this is episode eight, that's a recurring theme. There's really only been one thus far that's not exactly sure how the company found out about him. But I know a little bit about BAH. I know they're a pretty big company. I assume there was a more formal process as far as HR. How did that process work to get from somebody contacting you about the position ultimately to a hire? Cal Jumper: Boy, it's been quite a few years. I retired in 2008. So I'm not sure I can tell you exactly how that process happened. The formal process was really about filling out the paperwork and contract information. The interviews were with people that I really already knew that I knew were interested in bringing me onboard. So the interview process for that job was very simple. Curt Sheldon: Okay, now I know that wasn't your ... Well before I go on to what you did after that, once you showed up at work ... In the military we're pretty good at bringing people on board, spinning them up and getting them to work doing complex things and getting them ready pretty quickly. I'm not sure that's always the case in the civilian world. Based on what you can remember and, granted, it's been 10 years, do you remember much about the onboarding? Was there a process or was it, "Hey welcome. Here's your job, figure it out"? Cal Jumper: It was a little bit of both. We did quite a bit of training on the Naval Aviation Enterprise and trying to use business principles to run the logistics side of Naval aviation. Cal Jumper: Previously it was all about being ready, readiness, and that drove everything. And we were looking at ways to save money and we started looking at many of those principles. And we tried to do it the same way through the enterprise, across Naval aviation, whether it be a Marine Corps aircraft or a Navy aircraft, active duty or reserve aircraft. Curt Sheldon: Okay, and one other thing about going onboard with Booz Allen, was there much in the line of salary negotiation or was there an offer and that was the offer? Cal Jumper: There was an offer and I countered and they gave me what I countered with. So there was some negotiation. I had been told you need to have a good figure in mind that you're willing to work for and, frankly, I was fortunate that they met my figure. But they would have hired me at a lower number had they been able to. Curt Sheldon: Yep, okay, I would say, again, this is episode eight, but ... The sample size is pretty small. I would say more often than not, the offer has been the offer, but it's certainly worth the counter and in your case, it worked. Curt Sheldon: Okay, so how long were you there in that position? Cal Jumper: Approximately six years. Curt Sheldon: Okay and that's been more than six years since you started there so you went somewhere else and that's actually where we met and that was with a company called Check-6. Curt Sheldon: Why don't you talk about ... Tell me a little bit about, again, how they found you, how the interview process went and we'll stop with that and then we'll see where we go. How'd they find out about you and then was there a formal interview process? How did that go through? Cal Jumper: Well, I had a life change. I met a lady that I wanted to be close to in Texas, so I needed to move to do that. So I put some feelers out with friends that I knew were working with Check-6. I'd heard about the company. I knew that with Check-6 you worked in the oil fields, you didn't ... where you lived wasn't really all that important. They would move you to your place of work. And I asked them for an introduction and then I went in and formally interviewed in the offices in Houston and was offered a position. So I started working for Check-6 as I left New Orleans for San Antonio. Curt Sheldon: With them, I know the process ... I came on with them a little bit earlier and the process changed a lot over the years. Did they have a formalized training program as you came on? Cal Jumper: They did. A lot of it was designed around getting people ready to work on the oil rigs, going through the various safety training programs that you have to go through. The helo dunker, the stuff we all did on active duty as aviators. But you needed to have that stuff under your belt before you could go out to the rigs, whether it be off shore or even on land. Cal Jumper: And then there was some training on Check-6's theme, what they were teaching out in the oil field which was really the briefing and the debriefing based planning model that we used in Naval aviation. So didn't need a whole lot of training on that because I had been immersed in it for 28 years. But the way it was verbalized and taught was something that Check-6 gave us. Curt Sheldon: Okay, now, in that position, you were, as was I, you were an independent contractor. Any surprises about that process or what did you learn going from being an employer to being an independent contractor? Cal Jumper: An employee, you mean? Curt Sheldon: Yeah, employee, sorry. Cal Jumper: Just needed to ... For one, I needed an accountant. It was no longer a simple task of doing taxes with W-2s. You needed to keep much closer account of your costs and expenses and when you get your 1099 at the end of the year, it's accounted for a bit differently and the tax burden is higher because you're the one that is employing yourself so you pay additional taxes that your employer once paid. Curt Sheldon: Yeah, I think ... I always tell people if they're thinking about either doing a job as an independent contractor or starting a business, I always say figure the government's going to take about 45% of your profits. Because by the time you factor in a 25% income tax and 15%, actually 15.3% of self-employment tax and then throw some state tax on top of it, you're going to be pushing 40, 45% pretty easily. Maybe even a little bit more if you're in a high tax state. So you really want to make sure ... We tend to not think about that self-employment tax and as you noticed, that's a heavy load. And it really, really makes a difference. Curt Sheldon: Now, again ... Oh, go ahead. Cal Jumper: I was just saying, you're right. I found that to be true. The one advantage I had was that I was living in Texas, which does not have a state income tax. Curt Sheldon: Yeah, that's why everybody in the Air Force is a Texas resident until they retire and then we have to take someplace else, but yeah, that does make a difference as well. Curt Sheldon: Here in Virginia it's 5.75% that goes to the state on top of what you pay the feds. Now, again, since I've known you for a while, you came in, I think you said around 2014, which was right about the time things started going not so well in the oil field and a lot of contraction in the oil industry. And I know you moved on to something else after that, as well. So what did you try your hand at next? Cal Jumper: Well, I stayed independent but I moved into real estate. First as a real estate inspector and built a nice little business doing that, but on my 60th birthday I was in two attics and on two roofs that were over 100 degrees, so I thought I needed to figure another angle in real estate and I got my license as a real estate agent and started doing that for, not a long time, for about 6 months. Cal Jumper: Really enjoyed the inspecting and enjoyed the start up in the real estate business felt like it was going to be very lucrative, but things changed again in Texas and I decided to move back to New Orleans and decided to retire. Then I got into academia. Curt Sheldon: Okay. From the business standpoint, any thoughts on that as far as things you didn't think about like licensing or things that people need to be aware of? Cal Jumper: Well, I mean, I became aware of it pretty quickly, but for both of those gigs, real estate inspector and the real estate sales, you have to be licensed and they are two separate licenses. It's the same agency in Texas that does it. That's not true for every state, but that's something you certainly need to look into if you're thinking about doing something like that. And there are expenses that are going to have to be paid up front. You can expense as you do your taxes, but you're going to have to cover them. Cal Jumper: I think the real estate inspection program that I went through, and I went through Champion School Real Estate to get both of my licenses, was probably about $4,500 to get the real estate inspector inspection and about the same, maybe a little less to get the real estate agent's license. Curt Sheldon: Okay, so you did the LLC route as well. Cal Jumper: I did the LLC route, basically because ... and I also had to carry Errors and Omission insurance because of the potential, if I made a mistake and it cost somebody money they might come back to me and want to be reimbursed. Curt Sheldon: Okay, yeah, I carry that as well. I think, pretty much, if you provide any service ... I don't know if they'll write insurance for everyone, but it certainly is something to consider. Curt Sheldon: Now you have mentioned, and I was kidding around on the last episode that I might have to change this ... turn this program into a drinking game that any time somebody says networking you have to take a shot, but you did talk ... Networking came up a few times and I think we all, at least those of us who have gone through the retirement transition, come to realize how vital it is. But if you could maybe just some general thoughts on how you did your networking. A lot of people say, yeah, it sounds kind of sleazy asking people to help me, self-promotion that's not the way I do things. That's not in our ethos. How did you go about using your network? Cal Jumper: Well, first of all I don't think of networking as being sleazy or not part of our ethos. I felt like that my network would help me just like I would help them. And I have paid it forward to many people, retiring Marines or Marines getting out of service, and helped them find work. So I had no compulsion about asking my friends and colleagues to put the word out and keep an eye open if they saw something that I might be interested in. And it worked out very well. And it was really not a formal thing. I know a lot of people do LinkedIn and Facebook and I do both those things, more to keep in touch with people than to network. Cal Jumper: I felt like that the value of my networks were the close friends, colleagues, fellow Marines, hunting buddies, people that I had known over the years that I might have helped along the way and they certainly were happy with helping me. And I've made a commitment that if I'm ever in a position to help someone else coming out of the service or just a neighbor down the street, I will offer to do that. Just because I think that is a great way to live your life. Curt Sheldon: And I'm in agreement with you. I don't consider networking sleazy but I think there is, amongst some out there, a perception that it is. I always tell people that when you told somebody to give me a call if you ever need any help, did you mean it? And everybody always says, yes, I did. Well, when somebody said that to you 10 years ago, they probably meant it as well. Curt Sheldon: Like you, I try to help people and I enjoy doing it. I think most of us do. That's the way we're wired on the helping side and we just need to be willing to let people help us as well because, like you said, it's really, no matter what people may think, it's really not sleazy and it's just people helping out people. So thanks for that. Curt Sheldon: So you mention taxes as being a surprise when you were self-employed, any other money issues or things that surprised you or things you would want others to know, on the basic level, no amounts, obviously, of the money side of the equation? Cal Jumper: Well, I was a bit surprised at how much investment it took just to get started. You really need to have about six months worth of income saved up if you don't have other means to ... things to depend on. Cal Jumper: One of the things that empowers us coming out of the service, especially as retirees, is that pension. And there's really no way to quantify how powerful that is in helping us get started in business on our own. Curt Sheldon: Okay, yeah, I do quantify the pension occasionally and I tell people it's probably worth 1.5 to $2 million. You would have to have that amount sitting in the bank, if you will, to generate the income that you're going to receive for the rest of your life. And I agree completely about the transition, having some money for the transition. It just takes the heat off, if nothing else. Curt Sheldon: If you've got to find a job 30 days after you retire so that you can pay your mortgage, that changes the equation a lot versus someone who's got some time. Like I said, takes some pressure off and gives you flexibility to find the thing you want to do. And, in fact, in the checklist that we offer as part of this program, that's step number one, is establish a war chest and even if you need to stop giving money to TSP or contributing to TSP to do it because there is, one, you need the buffer to make the transition and, two, there's no such thing as job security in the civilian world, including in the government as we're seeing right now. You need to be able to support yourself for several months if the paycheck stops for whatever reason. So that's a really good observation and really important that people do that. Curt Sheldon: Were there any resources, either online, otherwise, books, or anything that you found particularly useful during the transition? Cal Jumper: No, frankly, I can't say that there was. I did look into ... go online and review what I needed to review about companies like Booz Allen Hamilton and Check-6 as I decided to go that route and then I went to the state websites in Texas concerning inspectors and real estate sales so that I could understand what it was that I was going to be required to do to get those licenses, but beyond that, I can't really point to anything that I looked at. Curt Sheldon: Okay, did anything really surprise you as you went through the process? At any point, either going with Booz Allen or Check-6 or starting your own business, anything that really caught you off guard? Cal Jumper: I can't say anything really caught me off guard, but emphasize the point that you just made, even with the government, there's nothing guaranteed. About the time I was deciding to move to Texas, it was the first time that our government was shutting itself down if you remember, about 2008 it couldn't come to a budget agreement and companies like Booz Allen Hamilton were taking a lot of hits on what they were able to pay and keep going and contracts were ending and there was a lot of unsteadiness. That may not be the best word, insecurities is a better word, about where those contracts were going to go. And frankly, the effort got smaller and people had to take pay cuts in order to keep those efforts going. Cal Jumper: And then again, after moving to Check-6, everything was great for about two years and then the bottom fell out of the oil market and Check-6 dried up and almost disappeared. And many of us, and you were part of that effort, too, had to look at other ways to make a living. Then again, I say we're fortunate in that we have a pension and I cannot convey enough how powerful that is in letting you get over some of these bumps in the road. Curt Sheldon: Yep, agreed that the pension is a huge benefit. Were there any, if you want to talk about them, any ... I'm assuming, I know for me, being self employed there are really good days and there are really bad days. I probably had some really good days and some really bad days on active duty as well. Any particular low points that you might want to warn people about that happened to you? Cal Jumper: Well, not so much. I did feel like things towards the end of my time at Check-6 got pretty low because the company was scrambling in order to pay its bills and was asking us to do things that I didn't find quite ethical, frankly. They wanted to bill man days, so they wanted us to hang out with our clients. And I always felt like it was more important for us to be able to provide them a service and if we were doing that then it was worth the money. So that was probably the biggest disappointment I had while I was making these transitions. As I was building my home inspection business and moving into real estate, I actually very much enjoyed the interaction with clients. And my favorite clients, being in San Antonio, there's a lot of young officers and staff NCO families moving into town and buying that first home and helping them get into that first home was always very rewarding. Curt Sheldon: Okay, so I'm, as most listeners know, I'm retired from the Air Force. Air Force O-6s, or colonels, like to pontificate, given the opportunity. I'm assuming it's not too different in the Marine Corps, so I'll just open the mic for a few minutes for you to talk about anything you'd like to talk about. Cal Jumper: Oh boy. That may be a mistake, Jar. Marine colonels like to pontificate as much as Air Force colonels. I would say as you're making that transition, one of the things you need to realize is that, especially your audience is probably fairly accomplished. They're senior enlisted, senior officers. While they are on active duty they are important people and that phone rings a lot, people wanting their opinions. People value their guidance. Email is busy. There's a lot going on and every day is a fulfilling day. The day you retire, that phone quits ringing and emails quit coming. And all of a sudden nobody really cares what you have to say. That's probably the biggest jolt to your system that I found as I was making the transition and it's very important to develop, if nothing else, hobbies or a goal, something else you want to accomplish in life. And maybe it's just hanging out with your family, but make sure you've got a plan for that transition to fill the time, not just to make a living, but to fill the time. Curt Sheldon: Okay, that wasn't too bad. You didn't pontificate too long. So if ... again we've talked about networking a fair bit. If people wanted to get in touch and reach out to you, how could they do that? Cal Jumper: The best way's probably via email and it's cal, C-A-L, dot jumper, J-U-M-P-E-R @gmail.com. I'm also on LinkedIn, Cal Jumper, and Facebook if they want to reach out that way. But the most direct route's email. Curt Sheldon: Okay, thanks. Appreciate that lot and that'll be ... the address will be in the show notes as well. Curt Sheldon: And then, probably, like I do with all the podcasts, wrap up with one specific question. And if you were to go back six or 12 months prior to your retirement, so we're back in 2008, 2007, 2008, and what is it that you know now that you wish you would have known then? Cal Jumper: I wish that I had known how important it is to get your medical records complete and ensure that you know what your game plan is going to be with the VA. They've gotten better I think, but it's still a very bureaucratic process to make your compensation claim with the VA and it takes time and instead of stepping into a disability rating as you retire, it takes several years if you don't have all that taken care of before you get off active duty. Curt Sheldon: Yeah, I think that's very common. As you said, I think that things have gotten better. I think if our listener, if you're stationed in the national capital region, it's still pretty slow. There's a picture, we're covered by the Winston-Salem office and there's a picture I've got somewhere of just piles and piles and piles of medical records sitting on top of credenzas in that building. They say that the weight is so much that it's actually caused some structural damage to the building, so I agree completely that the VA is a very bureaucratic process. I would say, I don't know if you did it, I didn't and it was a mistake, but a Veteran Service Organization I think is a good idea, American Legion, VFW, DAV, they have people who can help you with the claim that will get things moving along. Did you use one of those or did you do it on your own? Cal Jumper: I used the DAV to make my first two claims, actually first three claims and they gradually got my compensation level to what I think is a fairly accurate level. I am now using VFW because that's who is here locally, but I think that you definitely need to use the service organization just because they understand the process and you're not doing it alone. Curt Sheldon: Concur. So, Wookie, with that, we'll wrap up. Again, I want to thank you for coming on the show. I know you're getting about ready to start the semester so things will be picking up for you, getting kind of busy, but appreciate your time and your insights. I know the folks listening to the show do as well. And just one more time, I just want to say thanks. Cal Jumper: Thank you, Jar. I enjoyed talking to you this morning and I hope you have a great 2019. Curt Sheldon: Same to you, thanks. Speaker 1: It's not easy balancing the demands of active duty and searching for your second career. That's why we put together a retirement financial checklist, tailored for senior military officers. With it, you'll organize your financial affairs and avoid mistakes when you retire. And the best part is, it's free. You can get it at clsheldon.com/eagles.